Pensions, Casinos and “Prono” – It’s Gambling Update Time! It wouldn’t be a blank weekend without an update on the goings-on in the Korean gambling world. And there’s been plenty to catch up on. Last December, we reported on the new Annuity Lottery being introduced. 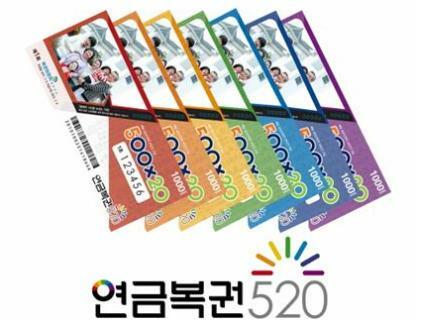 It finally debuted at the beginning of July under the name “Pension Lottery 520” with winners receiving 5 Million Korean Won each month for twenty years. There are two winners each week with the draw live on the YTN News Channel on Wednesdays at 7:40pm. Each ticket costs 1000 Won with 6.3Million tickets issued weekly. Sales so far are reported to have been stronger than expected. Next up is the age-old subject of casinos. The Ministry of Culture, Tourism and Sport is once more pushing for Korean citizens to be allowed into casinos. Korea has 19 casinos up and down the country, but 18 of them are only open to foreigners. The Culture Ministry is not known for supporting racing – which is run by the rival Ministry of Agriculture, Fisheries and Farming – when it comes under regulatory attack, so it will be interesting to see how this one plays out in the weeks ahead. Incidentally, Jung Byung Guk looks like a minister worth getting to know if his twitter feed and website are anything to go by. Last up, Seoul Central District Prosecutors’ Office have indicted three people for running an illegal “virtual horse racing” betting ring. The three are accused of running books on live streams of virtual horseracing (of the type used in many countries around the world) from servers in Hong Kong to Korean punters. Turnover of the illegal operation is reported to have been 8.7 Billion Korean Won. 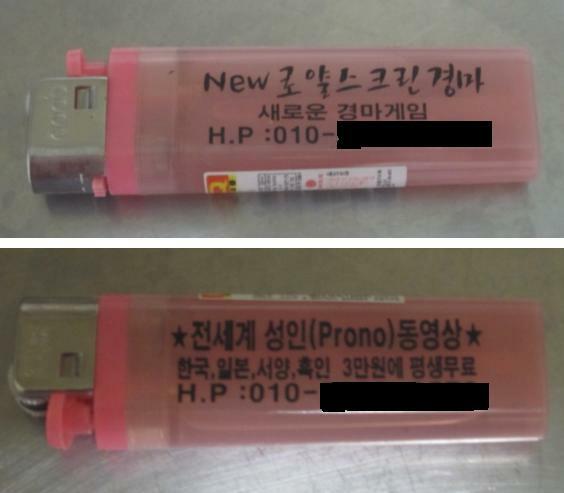 Cigarette lighters on the way out of Seoul Race Park offer betting Screen Racing as well as something called "Prono"
These operate on the same principle as the online ones only the betting is done in person. Typically there will be a mobile number to ring – sometimes the numbers will direct punters to a website for online gambling and sometimes to a physical location for “live’ gambling. Interestingly – and perhaps tellingly – on the reverse of these adverts are listings for something called “Prono”, both “Korean and Japanese” for 30,000 won. The telephone number (redacted in the picture to protect the not so innocent – and because Gyongmaman likes his kneecaps in working order) is the same on both sides. 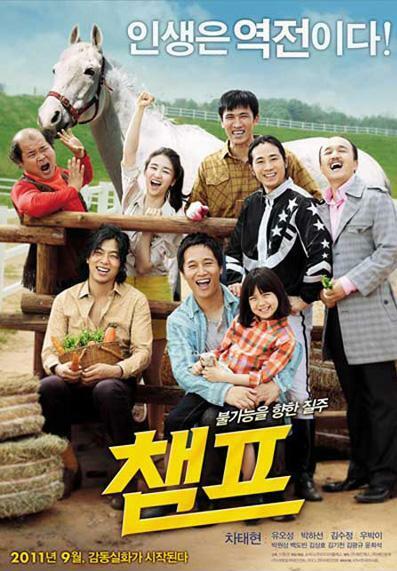 For the second year running a Korean movie based around horse-racing is set to be released in time for Chuseok (Korean Thanksgiving). “Champ” will hit cinemas on September 8. Publicity poster for the movie "Champ"
It’s the third Korean racing movie of the past few years following 2006’s excellent “Gakseoltang” (Lump Sugar) and 2010’s visually impressive, but largely disappointing, “Grand Prix”. That it’s timed to cash-in on the Chuseok market tends to suggest it may fall into the latter category, however Gakseoltang’s director Lee Hwan Gyeong being in control gives some hope. According to Hancinema.net, the plot involves a jockey losing his wife in a car accident that partially blinds him. He goes on to lose all his money “cheating” on horses before fleeing to Jeju Island (as everyone always does in Korean racing movies). There he meets a broken down horse who he starts to train. The rest, no doubt, writes itself. Champ is said to be inspired by real-life Korean racehorse Luna (although the real-life story is a little different), who is being used by the KRA to promote racehorse ownership in Korea. As a two-year old going through the sales ring, such were rumours about her unsoundness that Luna [Concept Win – Wu Su Hae (Exactly Sharp)] was very nearly not sold at all. In the end she went for the lowest price in the entire sale (US$9,000). 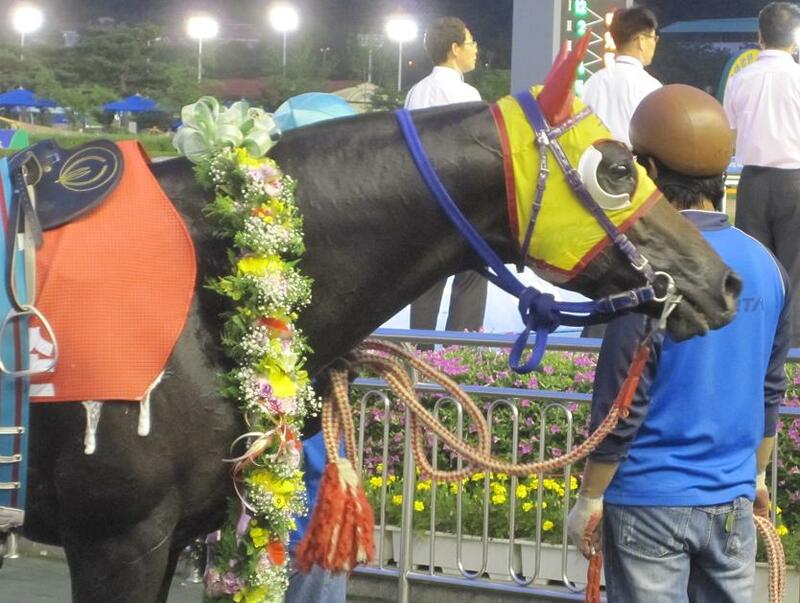 The rumours weren’t without foundation, but with careful conditioning and sensible campaigning, she went on to become one of Busan’s best known horses. The mare, known affectionately/unkindly (delete as applicable) as “Limping Luna” won the KRA Cup Mile (before it became part of the three-year old Triple Crown) in 2007 and the Busan Owners’ Cup in 2008 as she racked up thirteen wins from thirty-three starts in five years of racing and nearly $800,000 in prize money. 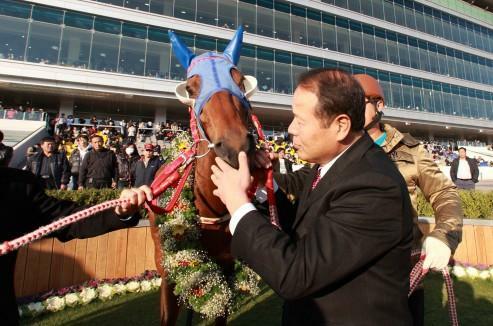 On her retirement in 2009, she became one of very few Korean racehorses to be honoured with a ceremony marking the occasion as she was brought back to the track to limp canter down the home straight one final time. 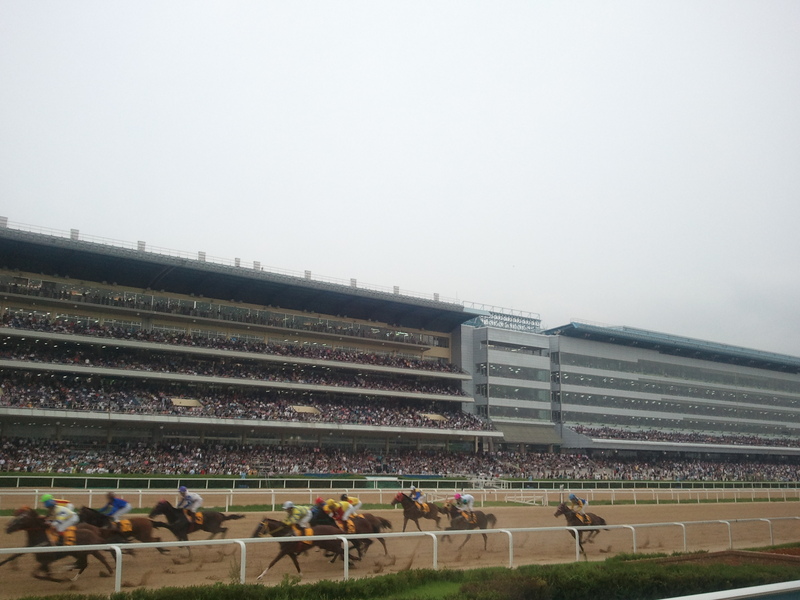 Currently there are 1000 registered owners in Korea, 50 of whom are new to the sport this year. The KRA is looking to promote direct ownership by individuals, company ownership and also, for the first time in Korea, syndicate ownership. Aware of the negative image that horse racing has in Korea due to the gambling element, it is seeking to publicise the fact that many prominent figures around the world – Queen Elizabeth II, Steven Spielberg, Sir Alex Ferguson, Michael Owen, and the late George Steinbrenner (among others – these are those quoted in the various press releases) are or were racehorse owners. Whether it will be successful or not will be seen in due course but it is undoubtedly true that the social stigma attached to horse racing is one that needs to be overcome. “Owning racehorses” is a CV entry that a Korean executive is likely to not want lest it harm his promotion opportunities. As a result, the vast majority of racehorse owners in Korea are either retired or are small business owners. How they solve the second issue – that ownership is expensive and, even though prize money at all levels of racing in Korea is excellent, still likely to be a loss-maker, is another. High Point cruised to victory in the SBS Cup at Seoul Race Park this evening in a remarkable return to form for the trainer/jockey combination of Shin Woo Cheol and Cho Kyoung Ho. Champion jockey Cho had faced much criticism from punters for his ride on Tough Win in the Busan Metropolitan last week after he allowed the Shin trained defending champion to get sucked into a speed duel with Dangdae Bulpae right from the start. The pair wore each other out and played no part in the finish as Yeonseung Daero scored a narrow victory over Dongbanui Gangja. Today on High Point, a completely different kind of horse, it was completely different. Cho dropped the five-year old, who was sent off as third favourite in the betting behind last year’s winner Wangson and former Ttukseom Cup winner Triple Seven, right to the back of the field as they approached the first corner, leaving it to outsider Pop’s Slew and old-stager Hongji to set the pace. However, as soon as they got into the back straight, Cho made his move, bringing High Point right around the outside of the field to take him to the front. He didn’t stop there though and another burst of acceleration took the pair clear of the field as they rounded the hometurn. Into the home straight and the challenge from the favourites never materialised. The race was won with a furlong to go and Cho had the luxury of being able to showboat his way through the last 100 metres. Behind them, Cheonun, second in the Oaks last year, got the closest – six lengths adrift, with Pop’s Slew gamely hanging on for third in a photograph with Special Volpony. High Point (Silent Warrior) moves onto seven wins from his twenty-three starts. 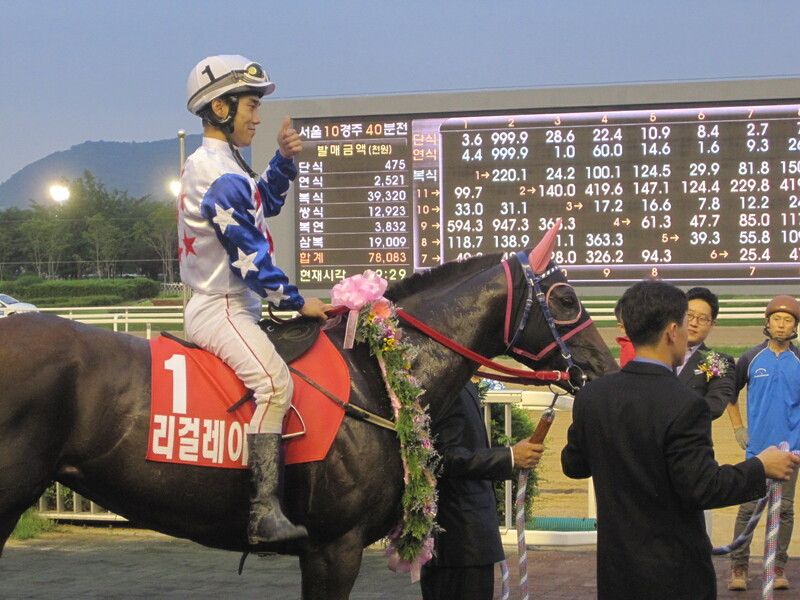 For Cho Kyoung Ho it’s a first Stakes success of 2011 and his second SBS Cup following his win on Neocheon in 2007. The champion jockey has had his critics in the past week, but today he was back to his best. Racing takes its annual summer break next weekend with all three tracks dark. It returns the following week on August 5, 6, 7. Between now and then, there is plenty of news to catch up on from the first seven months of the season which we’ll start doing tomorrow. Next weekend is a blank one so as all three Korean tracks take their one weekend of the summer off at the same time. This week, however, sees a full program of action and the SBS Cup is set to send us into the short break as Wangson returns to defend the title he won on a hot night a year ago. Six-year old Wangson is lightly raced, with only nineteen starts to his name but he’s won eight of those and will be among the most fancied to take victory on Sunday evening. Baengnyeonbong, second last year, returns for another crack, as does 2010 Ttukseom Cup winner Triple Seven while Cheonun, second in last year’s Oaks, takes her chance against the colts. See below for a full list of runners and riders. There’s plenty more besides the SBS Cup this weekend. Saturday at Seoul sees three-year old filly Kkakjaengi (Put It Back), winner of two big filly and mare Stakes races this year – The Segye Ilbo Cup and the Owners’ Trophy – take on older males in the feature handicap. The field isn’t too intimidating and the US import could very well record her sixth victory on her ninth start. Busan meanwhile has a pair of class 1 feature races on Sunday as well as a rare class 1 sprint headlining Friday. 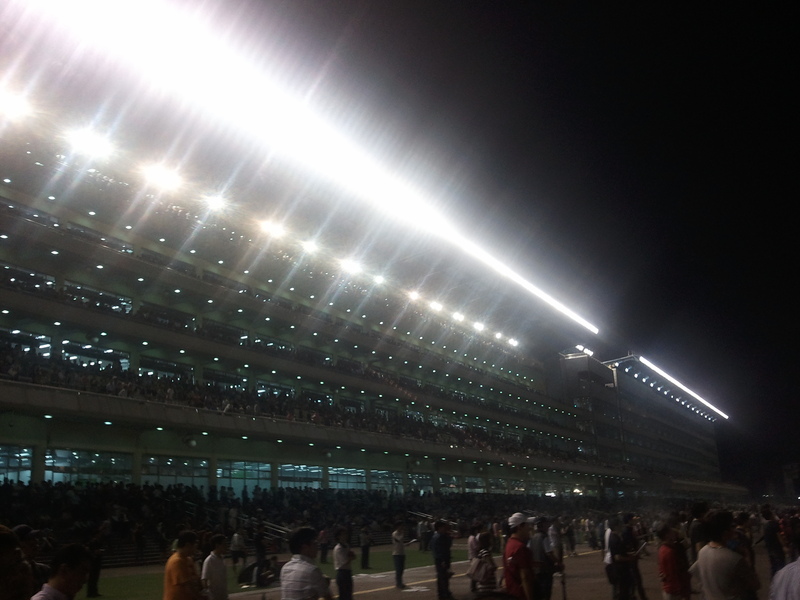 The monsoon season has finished and the really hot weather of the past few days is set to abate – Come Racing! Yeonseung Daero sensationally grabbed victory in a thrilling finish to the Busan Metropolitan Stakes this evening, grabbing a home victory for Busan and a striking a blow for Korean bred horses against their imprted rivals. The five-year old beat double Grand Prix champion Dongbanui Gangja by the narrowest of margins after the two had given everything in a duel down the stretch. Pre-race favourites Dangdae Bulpae (Biwa Shinseiki) and Tough Win (Yonaguska) set off out of the gate at a ferocious gallop and started racing each other for the first corner. By the time they entered the back straight, the pair had opened up a lead of ten lengths on the field. 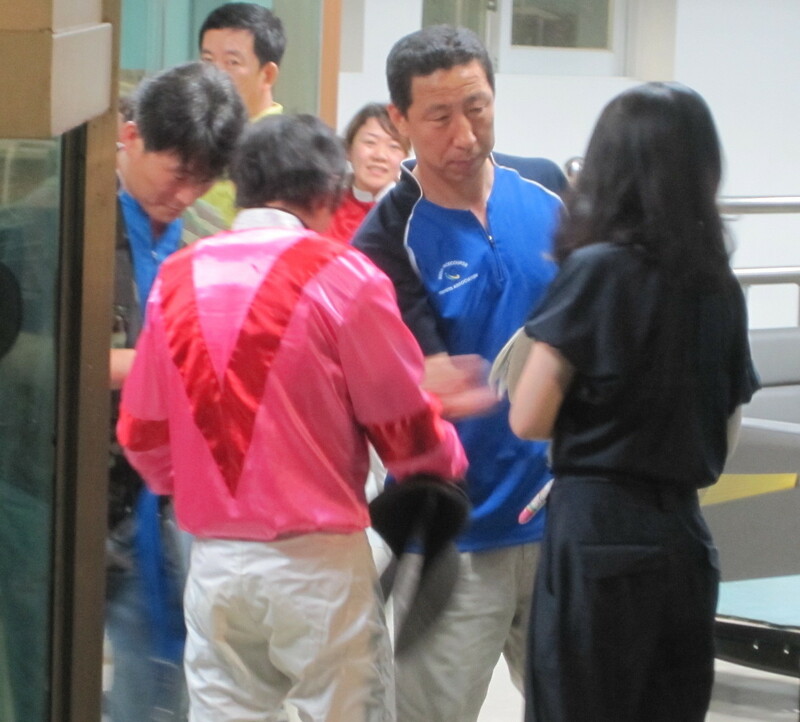 It was a risky game for jockeys Jo Sung Gon and Cho Kyoung Ho to play given the kind of quality behind them and slowly but surely as they turned for home, Dongbanui Gangja (Broken Vow) hove into view with Yeonseung Daero (Creek Cat) right there with him. The favourites had given too much and the stage was swept clear for the stretch battle. It ebbed and flowed with both horses looking at one point as if they would go on to take a clear victory. But both kept on fighting back. In the end it was Yeonseung Daero who had his head down at the right time to land the biggest prize of the summer. Six lengths behind them, Baekjeonmupae (Traditionally)led the field home with Cheonjidolpung and Mai Beppu landing a creditable money finish in fourth. As for the favorites, Dangdae Bulpae trailed home in sixth with Tough Win in eighth. Both left their races on the first corner. Yeonseung Daero has had a remarkable career. So often the nearly horse – first behind Sangseung Ilro in 2009 and then Dangdae Bulpae in 2010 and the early part of this year, he has still managed to notch fifteen wins from thirty-four starts. Never taking the easy option, his owners have entered him for everything, more often than not taking on the imports instead of hoovering up weak domestic handicaps. Today, finally, they got their reward. Would it have been different had Mister Park been there? As one who also likes to hit the first corner in first place, he may well have got sucked into the early battle between Dangdae Bulpae and Tough Win. 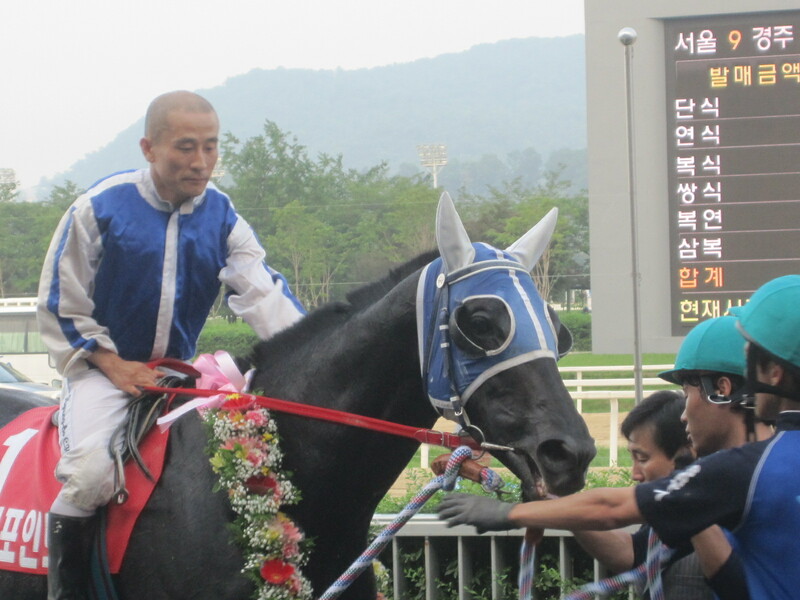 Or, given a good ride by Yoo Hyun Myung, he may have joined Dongbanui Gangja and Yeonseung Daero in being perfectly placed to pick them off in the straight. But who cares? There will be plenty of days to talk about Mister Park. Today, Yeonseung Daero is the Champion. Thirty minutes before they saw their best horses get downed once again by Busan, punters at Seoul were also treated to s spectacular finish to a Stakes race as Legal Lady (Lethal Instrument) held off a valiant late charge by second favourite Yeongtap (Sunday Well) to win the Munhwa Ilbo Cup. One of only two fillies in the race, Legal Lady was winning her sixth race from ten starts and seems destined to end up in class 1 racing sooner or later. Legal Lady’s win saw a welcome return to the Stakes winner’s circle for former jockey Chun Chang Ki. Now a trainer, it was his first big race win. The big summer of racing continues next week with the SBS Cup at Seoul. History won’t be made now that Mister Park has been withdrawn from Sunday’s Busan Metropolitan Cup but we still have a cracking race on our hands as two home-grown Busan boys take on the massed ranks of an invading force of imports from the Capital under the floodlights. A collective groan was heard around the Korean racing community on Wednesday when the name of Mister Park (Ecton Park) was missing from the list of declared runners for the Metropolitan. The 2010 Grand Prix champion is just one race away from a record-breaking sixteenth consecutive victory. He’s not injured so did connections get scared of putting his unbeaten record on the line against the best in the country when he only needs one more win? One will have to take them at their word when they say he took a long time to recover from carrying 60 kilos in his last outing and would not be at his best. Nevertheless, a chance has been missed to go into history in the most glorious way imaginable. So what are we left with? An exceptional race is what. And we still have the narrative. Only two horses from the home track will take part and they are the only two Korean bred horses in the race. Yeonseung Daero (Creek Cat) second in this race last year, and the remarkable five-time Stakes winner Dangdae Bulpae (Biwa Shinseiki) will be fighting for both local and national pride come post time. Either are capable of doing it but they’ve got a mammoth task on their hands. From Seoul we have the two Superstars. Tough Win (Yonaguska), last year’s winner and Horse Of The Year and Dongbanui Gangja (Broken Vow), the double Grand Prix winner who finally snapped out of his bad habit of running wide to soundly defeat Tough Win a month ago. These two are game for anything and while Tough Win has the speed, 2000 metres is at the very upper limit of his capability. Most see it as a straight fight between these four. Tough Win and Dangdae Bulpae are the most talented but Dongbanui Gangja and Yeonseung Daero are arguably the gamer. We could be in for a treat come 7:45pm on Sunday evening. The race will be simulcasted back live to Seoul Race Park where the Munhwa Ilbo Cup will be the major live event at 19:10. Yesterday it was Akane Yamamoto in Busan, today it was the turn of Japanese jockeys Mai Beppu and Makoto Noda in Seoul to record their first winners in Korea. And after what had been a long wait, they did them in style too. Beppu was up first. She debuted in March this year but only had five rides before injuring an arm in the starting gate which put her out for two months. Today she finally got that elusive winner in race 5 as she took second favourite Seungseungmanseung (Buster’s Daydream – Dewhurst House) into an early lead that he never relinquished and raced away for an eleven length triumph. It was her 48th ride in Korea. Makoto Noda had to wait until five races later on the card and his 53rd ride since debuting at the beginning of June. It was worth the wait as Noda partnered five-year old Australian import Khaki Halls (Refuse To Bend – Karamea Star) to victory in the feature race of the afternoon. Noda sent Khaki Halls, who was returning to the track for the first time following an eight month lay-off, into an early lead and fought off the challenge of favourite Geumbi in the final furlong to win by two lengths. 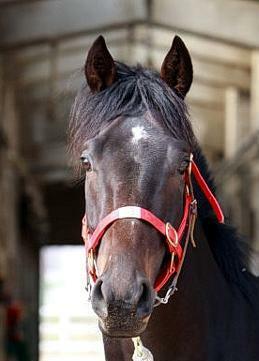 On Sunday, both Noda and Beppu will travel to Busan to ride in the Busan Metropolitan City Mayor’s Cup. Full preview will be up imminently. 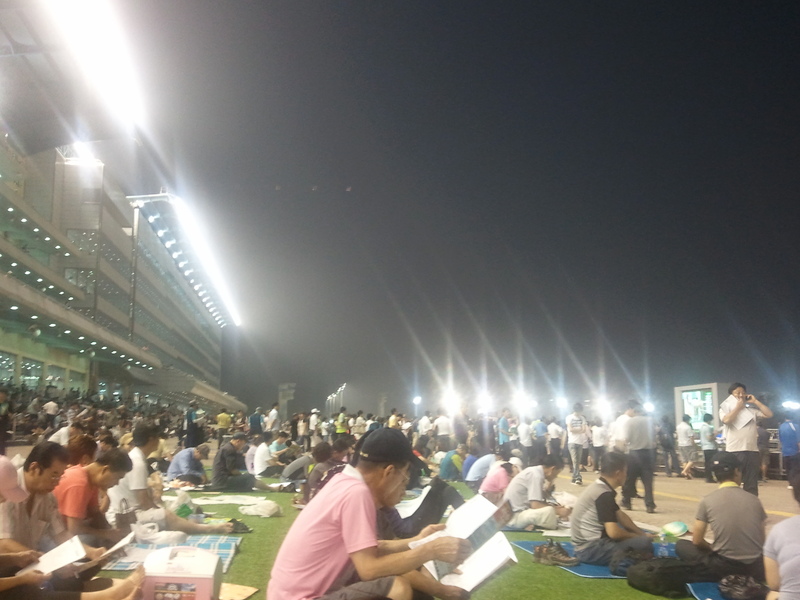 Today was the first day of evening racing – well afternoon and evening racing, the first race was 2:20pm and the last 8:50pm and it was also the first day of Lee Shin Young’s training career. 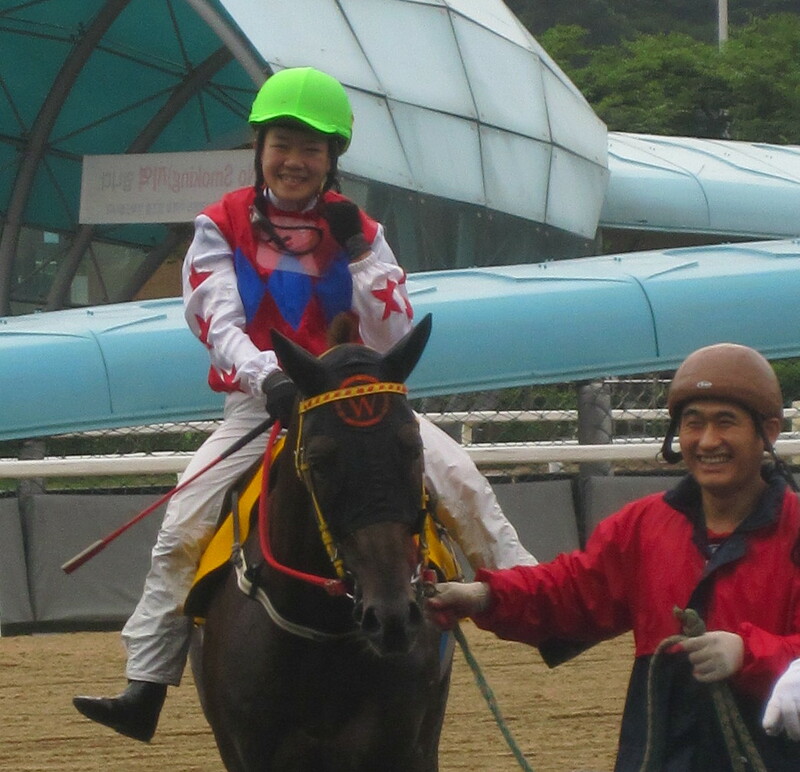 In race 1, Lee became the first Korean woman to saddle a runner for a race and 35/1 outsider Red Money did her proud by finishing “in the money” in fourth place. Lee has one more runner on Sunday. Lee’s former compatriot in the jockey ranks Lee Ae Li did not have a good day though, ending it in hospital after a nasty fall from filly Noble Harmony who sadly broke down in the back straight during race 8. Noble Harmony (Walkslikeaduck) was running for the 23rd time and was without a win. Nevertheless, she had picked up approximately $30,000 of prize money and was reasonably well-fancied today. Sadly the fracture in her leg was too severe for her to have any chance of making a recovery. May Noble Harmony rest in peace.